Being a customer oriented organization, we are engaged in manufacturing, exporting and supplying a wide range of Bushed Roller Chains. 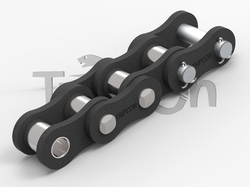 These bushed roller chain are manufactured in accordance with the international standards of quality making use of qualitative raw material. To improvise our offered product-line and for selecting our vendors, our R & D team conducts various research activities. Our customers widely appreciate our offered range for its performance and accurate dimensions. Backed by rich industry experience, we are presenting a vast variety of Industrial Bushed Roller Chain with K2 Attachment. The offered chain attachments offered by us find wide application in various industries for and sectors. Moreover, our qualified team members manufacture the entire range as per various well-defined parameters to ensure their adherence with international standards and norms. 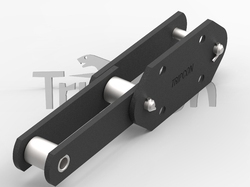 We have gained expertise in delivering a quality range of Elevator Bushed Roller Chain. This range is designed and manufactured using qualitative raw material, in compliance with the industry set quality standards and norms. We have gained expertise in delivering a quality-assured range of Solid Pin Chain to the customers. Our offered product range is made available in different capacities, sizes and other specifications to meet the multifarious needs of the market in an affluent manner. These Pin Chains are fabricated using qualitative raw material that is sourced from the most authentic vendors of the industry. Looking for Bushed Roller Chains ?